Dollar disappears! Every self-important guru worth his salt knows that. We don’t disagree gold will be left standing when paper currencies finally take the celestial dirt nap. But the headline begs the question: just when will said top-dog paper currency take that dirt nap? We know of one guru who actually believes, or I should said believes it enough to peddle the consistent garbage he funnels onto people who know no better or want to believe such tripe, the US dollar will virtually disappear by 2012. Another major newsletter guru is much more bullish, he too touts the dollar will indeed disappear, but not until his kids get into college—no clue as to age of kids or whether they wish to attend college so that forecast still a bit vague. 1) This type of talk—the yuan taking the place of the dollar is part and parcel to the huge negative sentiment towards the buck right now. No surprise really. When helicopters are on a mission to air drop as many pallets of greenbacks as fast as they can, it can shake one’s confidence in the future of the currency. But as we all know, maximum bearishness is usually a great time to buy an asset, not sell it. 2) China will be quite happy to exit global rebalancing fully intact; worrying about currency hegemony is likely not on the agenda. Heck, they have rare earth materials to stockpile and are still too busy trying to remove words from their official language, which might lead to more “incidents,” such as: democracy, Chart 08, and riots. It would be a perfect job for Winston Smith, a clerk in the Records Department of the Ministry of Truth, as described in Orwell’s classic 1984. Winston was good, very good, and he didn’t even have the top Western internet software to work with in his days. Now, the two items above if true, doesn’t mean the dollar jumps for joy in a massive new trend. But it does mean this: the dollar will more than likely remain at the center of global finance during our lifetimes and will move up or down during that time as it always has, based on the buying and selling by real people reacting on the truth or falsehood of their expectations as the light of real events plays out. In an effort to share my guru tendencies with you, and not having the benefit of the “kids going to college someday forecast,” as three of my four kids are done college and the last crumb cruncher is already matriculating. Plus, I think it highly unlikely even Uncle Sam, imbued in his infinite wisdom and resources, has enough left over census works to go door to door collecting all those greenbacks in time to make it disappear by 2012. So I did the next best thing and developed an equation. Now I can say, “on the other hand,” just like real economists do. 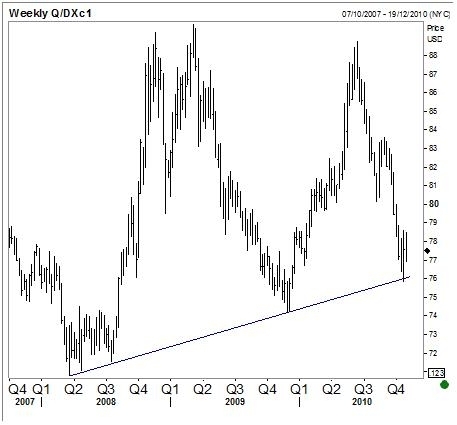 It says: The dollar goes lower if global cooperation on the currency front doesn’t get any better, or much worse, and if QE2 is more than or equal to what is expected, and EM markets continue to grow without concern of bubble trouble. The dollar goes higher if global cooperation improves, i.e. implicit deal between the US and China, which assumes lower than now anticipated QE2; or if global cooperation gets worse, i.e. trade tariffs materialize, the dollar goes higher on a risk bid; and the dollar goes higher on any emerging market accident a la the risk bid. Bottom line: If the US continues to muddle-through, and everyone is happy with the dollar as global fuel to prop up risky asset prices, the buck looks like it will be heading to dirt nap territory and all the news of its disappearance will be re-emphasized in the usual full confidence, as expected. But if price really does lead fundamentals, as we believe they do, and the dollar for some strange reason doesn’t soon retest the weekly trend, just maybe the sentiment extreme is in for a while no matter how many helicopters are in the air.